The general consensus surrounding Sony’s PSX 2016 Showcase is that it was a better than expected show. That’s hard to argue with considering how one of its announcements, The Last of Us Part II, could have easily stolen the show at E3. The hour-long conference had some great trailers, surprising announcements, and plenty of newsworthy events for fans to talk about. It was definitely the right way for the console maker to kick of the PlayStation Experience 2016 in Anaheim, California. That said, even if Sony did a really good job, there is still always room for improvement. Sony’s PSX 2016 Showcase had some notable shortcomings, and a certain sequel that came straight out of everyone’s joking suggestions. After having some time to reflect on everything that was shown, I’ve come up with quite a few disappointments about the event, and the initial wow-factor has worn off. Check out the 10 biggest disappointments from the PSX 2016 Showcase below. 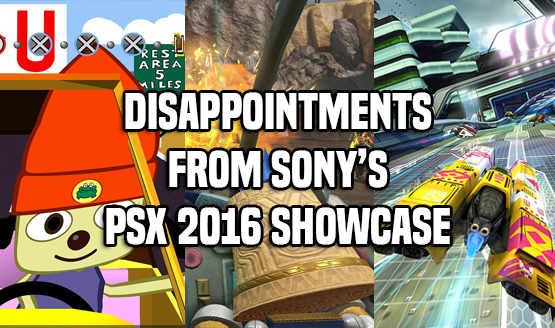 I hope you enjoyed my look at 10 disappointments from the Sony PSX 2016 Showcase. While there were certainly some less than stellar moments, it’s still worth saying that Sony had a really entertaining event. Even if you weren’t excited by the Knack 2 announcement, you probably had a good laugh, and it was really incredible to see the fans react so positively to the Marvel vs. Capcom announcement. It really showed how passionate Sony’s fans are. Let us know what you thought of the Sony PSX 2016 Showcase, and if anything disappointed you about the event, in the comments below.